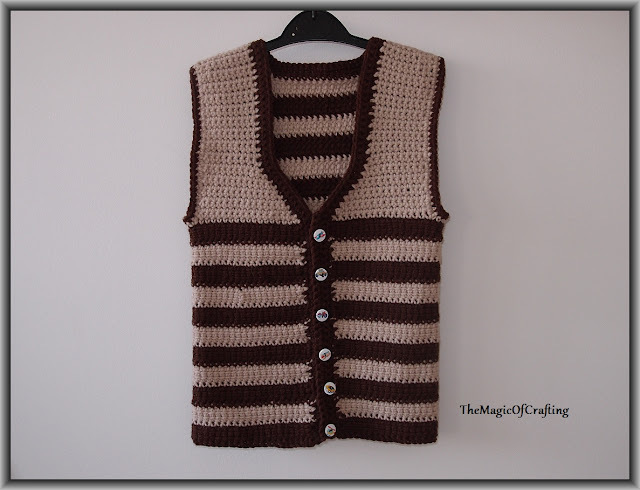 This crochet gilet has interesting and unusual look while it is simple and fast to crochet in the same time. 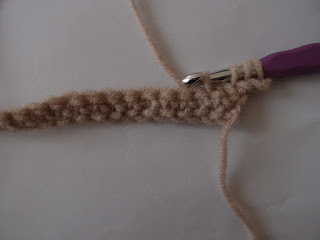 I have used J/10 (6mm) hook and suitable worsted weight yarn with two colors with no cutting and weaving in between the rows in different colors but transfering the yarn to the next row. Finally I have made a border at the ends to hide the yarn that is being transfered. The instructions are written for two sizes - 4 and 6 years old. 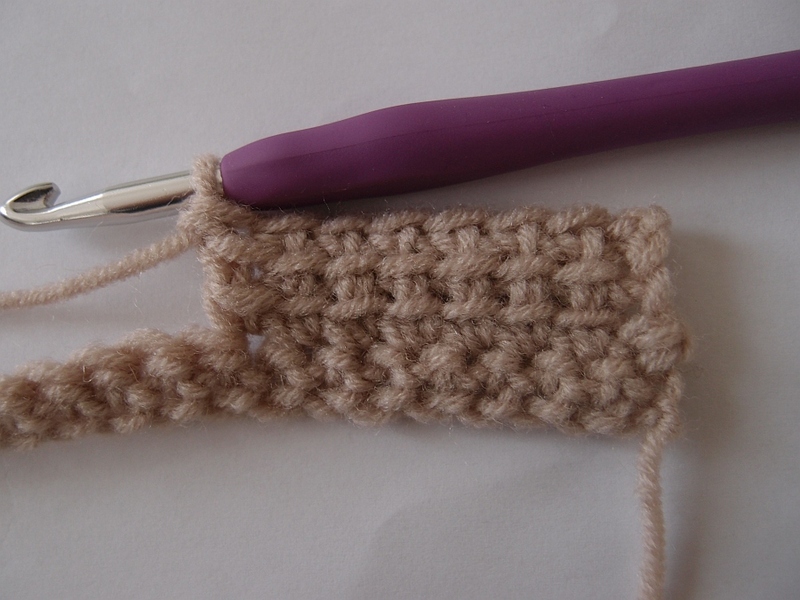 Gauge: 4in/10cm x 4in/10cm is 13 st x 8 rows (alternating row of tr and row of sc). 1. To get the correct size at the end make a sample first to check the gauge. 2. This vest fits just around the toddler's body. If you want wider vest just increase the starting chain. 3. To prevent from unraveling often measure, measure, measure ... :) If your model is not available or does not want to then get some of its tops. 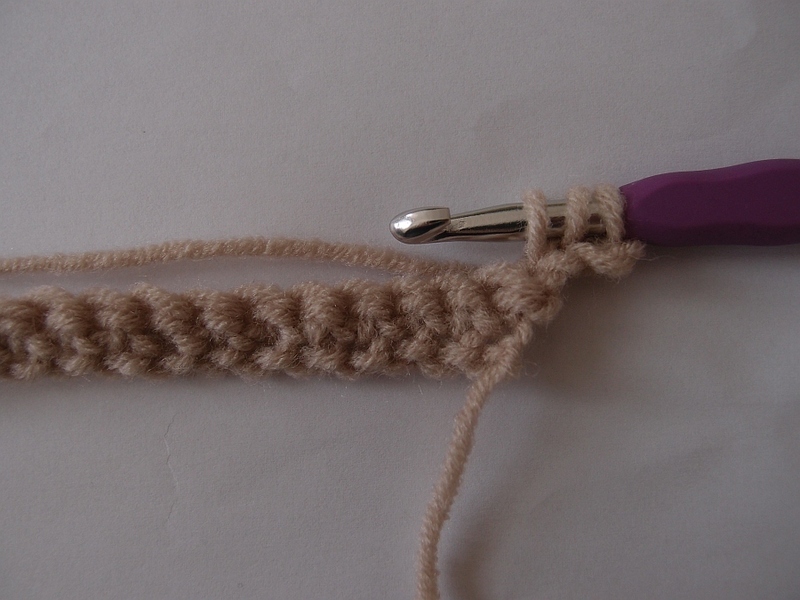 The linked treble crochet rows make it crochet fast. 4. If you need smaller vest try to decrease hook size. For bigger vest try increasing the starting chain. 5. 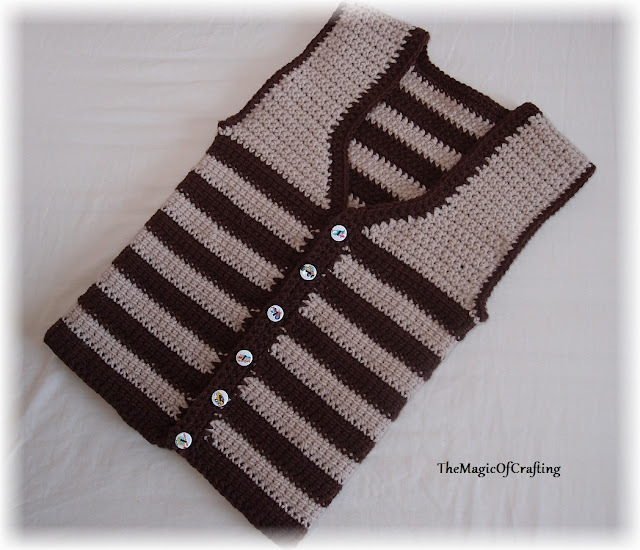 The vest is crocheted from the bottom to top. 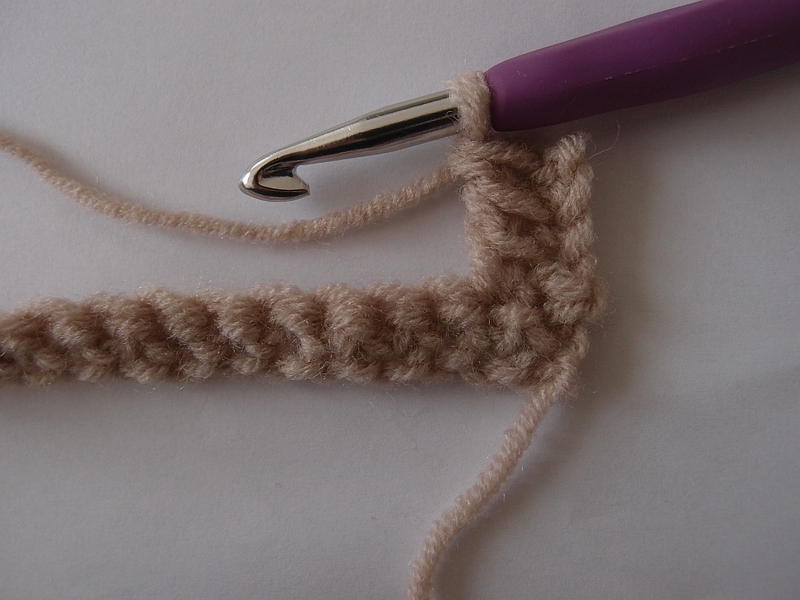 Start of the row - ch 4.
insert the hook in the next st and draw a loop (4 loops on hook). Now finish like normal tr stitch - yo, pull through two loops, yo, pull through two loops, yo and pull through last two loops - first ltr made. Next ltr are done similar way - insert the hook in the two horizontal loops from the first ltr made instead of ch loops. First in the loop 1, then loop2, then the next st - 3 loops on the hook. Then finish off like normal tr. The written instructions are for size 4, the next size is in the brackets. With color 1 ch 85 (95), insert the hook in second loop from chain and sc across in the third loop of the starting chain. The third loop is the loop behind when you look at the chain on the hook. This will give finished look to the border, there will be no need to make additional border to the bottom of the vest. Before continuing with the pattern measure if it fits with either a kid's top or directly on the kid (if you are allowed to :) ). Row 1: Ch 4, make a row of ltr (see the note above on how to make ltr). Turn. Row 2: Join color 2 (don't cut the yarn from color 1), ch 1, sc in same st, sc around. Turn. Row 3: Ch 4, make a row of ltr. Turn. Row 4: Change to the other color and rep row 2. Row 5, 7, 9, 11, 13, 15, 17: Repeat row 3. Row 6, 8, 10, 12, 14, 16, 18: Repeat row 4. 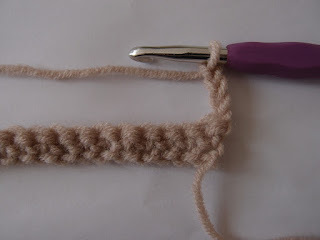 For the next size make two more repeats of row 3 and 4 with the next color. Now it is time to form the arm hole. Before that measure the bottom part to make sure it is long enough. 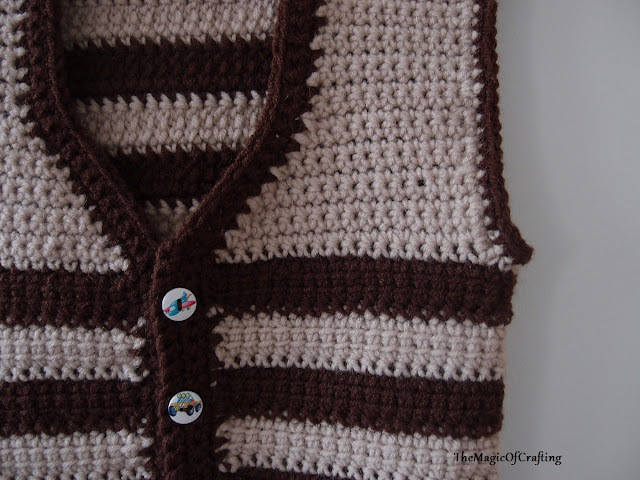 The front top part is crochet with one color only. Row 19: Ch 1, sc in same st, make 18 (21) more sc. Turn. Row 20: Ch 1, sc in same st, sc in each of next st. Sc2tog in last 2 st. Turn. Row 21: Ch 1, sc in next st, sc till end. Turn. Repeat row 20 and row 21 till only 11 (13) sc left. Next rows are only from sc - start with ch1 and sc in same st and continue with sc in each st till the end. Now make the same on the opposite part of the work for the top left part of the vest. 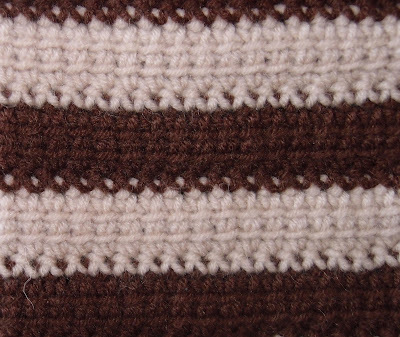 The back part is done alternating the two colors the same way as for the bottom part. Now that you have crochet the front pieces leave 6 stitches for the arm hole and join yarn. Continue crocheting alternating row 3 and row 4 (leave 6 st on both sides for arm hole). Repeat till there is only 1in (2.5 cm left) to make is as long as the front parts. Start from one of the edges - Ch 1, sc in same st, make 11 more st. Turn. Ch 1, sc in next st, sc till the end. Turn. Ch 1, sc in same st, sc2tog for the last 2 st. Turn. Now make 2 more rows of sc (no more decreases). Make the same on the other edge of the vest. Sew the front and the back part together. The arms border is just two rows of sc. 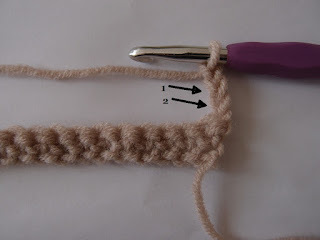 Front part border - make 2 rows of sc. 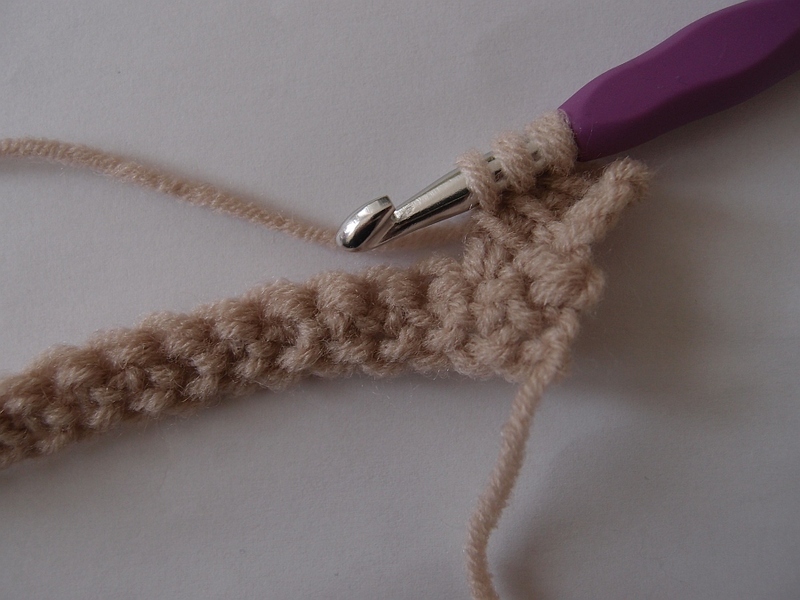 Spread the stitches evenly. I have done 3 sc for every row in different colour. On the next round of sc - on one side of the vest make a button hole on every row of ltr. The button hole 2 ch instead of 2 sc, then on the last round of sc make 2 sc in each chain. Instruction are a little unclear as what you mean for us to do.